What is the most disruptive force utilities face? No not solar, or energy efficiency or competitive energy supply. It’s you and me, the consumer. We want to take control over our energy use, and we’re getting more comfortable with the technology that lets us do that. At least that’s what focus groups indicated in a qualitative study on consumer energy behavior by Schneider Electric. 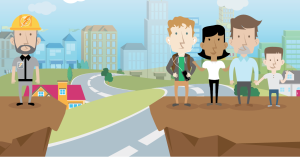 Researchers talked to consumers of various ages and incomes who had expressed interest in energy management in Columbus, Ohio; Austin, Texas; and Los Angeles, California. It turns out that having control over their energy use — such as being able to set home temperature remotely via a cell phone — trumped even saving money as a reason to manage energy, according to a white paper on the findings. “People were very interested in saving energy. A lot of people were interested in environmental benefits. But people really resonated with being able to have control over how they used energy,” said Jenny Roehm, senior manager, utility residential solutions for Schneider Electric. Interested in consumer energy behavior? So are we. Read more by subscribing to Energy Efficiency Markets’ free newsletter. Or follow us on Twitter @EfficiencyMkts. The paper speculates that consumers feel they have little control over much of their lives, so are eager to own something as fundamental as the comfort of their environment and their energy spending. They want control, but they’ll let go a bit to participate in demand response — where the utility compensates the customer for remotely reaching into the home and reducing energy use. They are okay with demand response as long as the utility gives them the choice to opt out at any time. Consumers are willing to do their part — but they want to understand why they should, Roehm said. For example, focus group participants expressed skepticism about utility motivation in pushing energy savings: Why would a utility want me to use less energy? But when they came to understand the cost of peak power and the reliability benefits of peak reduction, they were okay with the idea. The focus group made clear that information is key — information that consumers can use. “The bill at the end of the month is not actionable. They want more actionable information, and they want it more frequently,” Roehm said. The findings also underscore how cell phones and tablets have changed consumer behavior. Consumers are daunted by geek speak and complex energy monitoring gadgets. But they like and understand apps. When focus group participants learned that they can manage their home energy use via an app, they became more open to the idea. In fact, it’s a little astounding to them that they can manage so much of their lives via their cell phones, but not their electricity use, according to Roehm. This turn in consumer energy behavior, the desire for more control, creates a business challenge — and opportunity — for utilities. Navigant Research sees worldwide revenue from residential demand growing from $332 million in 2014 to $2.3 billion in 2023. It’s a market growing hand-in-hand with microgrids and local energy, and is likely to expand even more as consumer-owned plug-in electric vehicles enter the market. Utility customers have new expectations. Utilities can meet the expectations and give customers the control and information that they want. Or they can forfeit the business to competitors — retail energy suppliers, solar installers, community energy programs and the like. One thing is clear. Utilities will need to better customize their communications with customers — similar to the Amazon or Netflix approach. And they must abandon their tendency to engage in energy-speak. “Utilities talk in kilowatts. Nobody ever goes to the store on Sunday to buy more kilowatts,” she said. The Rocky Mountain Institute’s Amory Lovins famously said that consumers don’t want kilowatts or coal or oil. They want a cold beer a hot shower. And based on Schneider Electric’s research, they want a bit more now — an intelligent device that gives them remote mastery over the energy that makes the cold beer and hot shower possible. 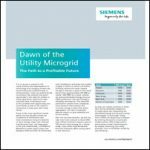 A Steady Ride Up for the Microgrid Market in 2017? How can we gain access to the paper referenced? This sounds interesting … with, as per above, interest in knowing how to get a copy. However, I wonder as to the real power of such focus groups in terms of providing insight on longer-term behaviors and practices. In a related arena, solar systems with web accessible data collection on rooftop performance see very high use of their data early in a homeowner having the system (with a high percentage checking production multiple times/day in the first weeks). By several months, a relatively small share are checking even on a weekly basis and this is down to just a few percent by year’s end. The ability to track the performance, however, is highly desirable by the purchasers — e.g. what people “want’ isn’t necessarily what they use. Having said that, with the ubiquitous nature of smart phones — I do expect that people would love inexpensive paths to, for example, turn up the heat as they drive home on a cold day.